When I first realized kale could be made into chips, I went a little overboard. But a cheesy version? That was a new challenge. This recipe was inspired by a recent trip to Trader Joe’s, when I discovered yet another amazing food item I’d never seen before: Cheesy kale chips! One bite in = mind blown. I was immediately determined to make them at home. Spoiler alert: It’s SO easy! Kale // Rich in flavonoids; lowers cholesterol; Vitamins K, A and C; anti-inflammatory. Nutritional Yeast // Thiamine, folate, vitamins B-6 and B-12, and contains all 18 essential amino acids making it a complete protein. Cashews // Heart-protecting unsaturated fats, protein, copper, and magnesium. Sunflower Seeds // Vitamin E and B, copper, selenium, magnesium, protein, and healthy fats. Make these chips for movie night, game night, when you’re hosting friends, or just need a snack. These would also make a great topping for dishes like avocado boats and spicy plantain black bean tacos or a great base for my easy vegan falafel (topped with this tahini dressing)! If you give these a try, let us know! Leave a comment and rate the recipe. And don’t forget to take a picture and tag it #minimalistbaker on Instagram. We’d love to see what you come up with. Cheers! 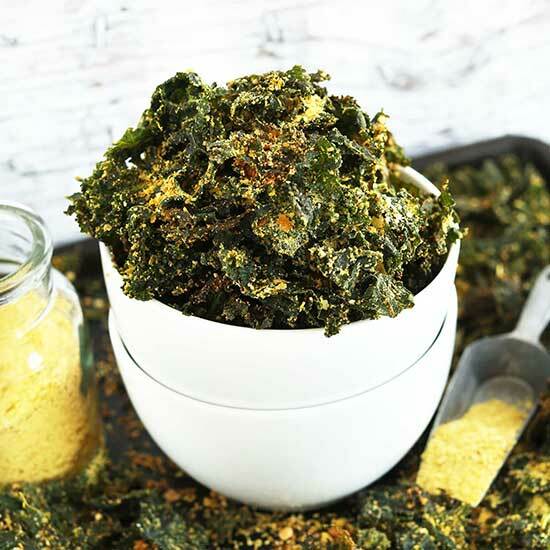 Easy, baked kale chips in just 30 minutes with 8 ingredients! Cheesy, crispy, and nutrient-packed! Preheat oven to 300 degrees F (148 C). 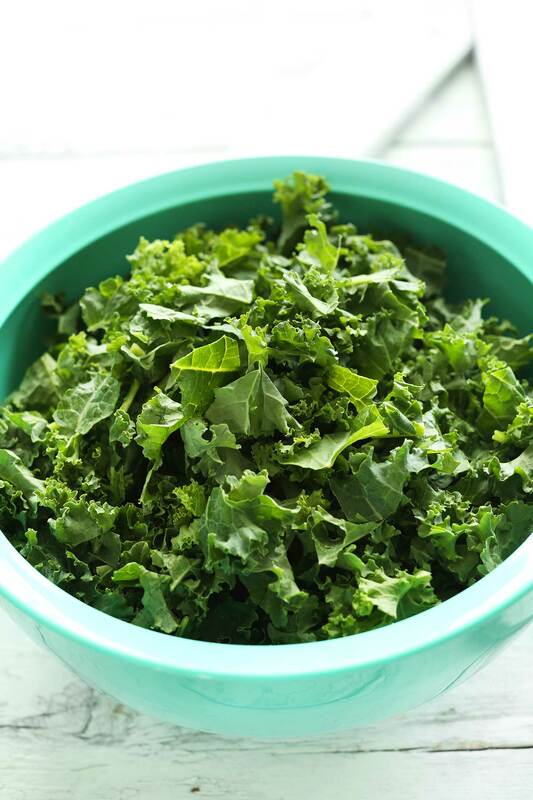 Add kale to a large mixing bowl and drizzle with oil. Use hands to massage the kale to soften its texture and disperse the oil. Set aside. Add cashews, sunflower seeds, 4 Tbsp nutritional yeast (12 g // amount as original recipe is written // adjust if altering batch size), salt, pepper, garlic pepper, and cayenne pepper (optional) to a food processor or blender and blend/pulse into a fine meal, scraping down sides as needed. Add spice mixture to the kale and toss with hands to distribute, working it into the grooves so it's thoroughly coated. Divide kale between 2 large baking sheets (or more if increasing batch size) and spread into an even layer, making sure the pieces aren't overlapping to ensure crispiness. You may need to bake them in two batches depending on size of baking sheets. 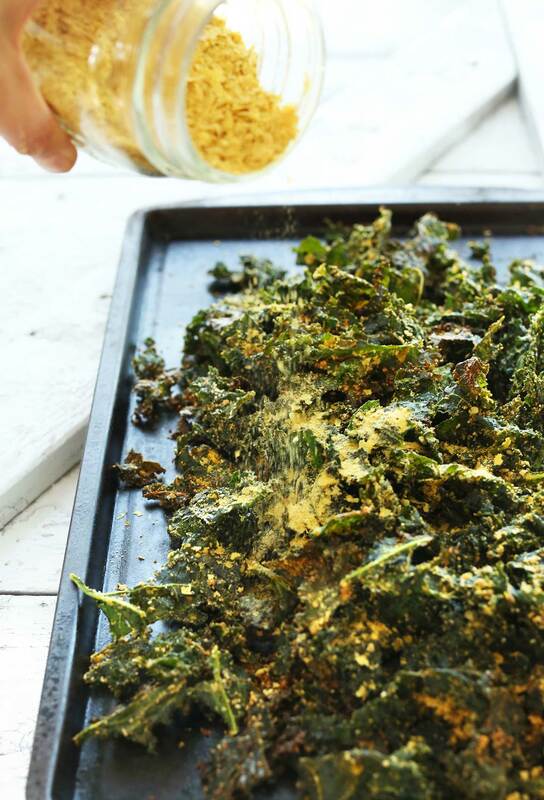 Sprinkle the kale with remaining 1-2 Tbsp (3-6 g // amount as original recipe is written // adjust if altering batch size) nutritional yeast for extra flavor and bake for 15 minutes. Then remove from oven and toss/flip kale to ensure even baking. Bake for 5-10 minutes more, or until chips are crispy and golden brown. Watch carefully to ensure they don't burn. Let cool slightly before enjoying. Once completely cooled, store leftovers in a large plastic bag or container for 2-3 days. The crispy texture begins fading past 24 hours, so enjoy as close to baking as possible! *Method slightly adapted from Oh She Glows! *Recipe as written yields ~5 cups. I started out with your exact recipe and made it many times, but over time I tweaked it when I was out of certain ingredients but determined to make Kale Chips. I now use smoked paprika instead of cayenne pepper and I use more than I would if I were using cayenne pepper. (everyone likes this swap) I also use more nutritional yeast and I use whatever I have available for nuts and use more of them as well. I have also found that using a champagne mango or an avocado with just a tiny bit of honey pulsated on the smoothie mode makes a paste and mixed with the Kale helps the dry ingredients stick to the kate better. (especially since I have increased many of my dry ingredients and probably start with more kale than 10 oz now.) I am not sure how this would work in an oven however as I use a dehydrator at between 115 and 125 degrees. Higher temperatures and you start losing some of the nutritional value of your vegetables!. I no longer measure and go by taste (LOL) That should give you an idea of how often I made these. FYI … I put all by dry ingredients after pulsating them well in a container that seals. I put my mango or avocado in another bowl after pulsating with just a little healthy oil; we also like coconut oil. I then put parchment paper on my dehydrator shelves and layer the kale on without it overlapping as much as possible. I set the temp between 115 and 125 degrees and let it go as it will take hours! You will know it is done by its crunch! I then use a sealer to draw out of air for anything we will not be eating immediately. However if at some point they do not taste as crisp, I put them back in the dehumidifier for about an hour and you have what tastes like warm fresh kale chips again. I want to say thank you for your recipe because without yours I would not have my own! My family loves these kale chips! I used Lacinato kale from my garden. I mostly followed the recipe, except for substituting pine nuts for the sunflower seeds and doubling the cashews. My kale pieces were on the small side so they were crispy in just 10 minutes without turning them. Love the nutritional yeast and the sprinkle of Malden salt that I put on them just before they went in the oven. Thanksforsharin* this great recipe! Wow! I followed this recipe to the T and they came out perfect! I’m using prechopped, bagged kale, so it took under 5 min. to prep. These are a perfect, but affordable, replica of “Brad’s” brand Vampire Killer. I looked at this recipe twice and it says cheese kale chips but the recipe doesn’t have cheese anywhere as an Ingredient so how are these cheese kale chips? 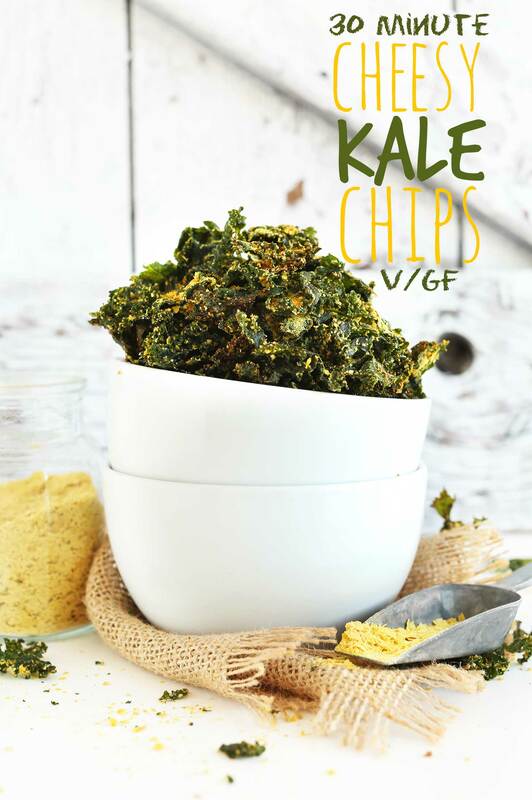 I made a batch of these last night after never having liked kale chips, and OMG they were delicious! I feel like I’m finally seeing the light! I’m addicted and now will have to have these every day until I get sick of them and take a break for a week and then come back to it because they’re just THAT AMAZING. Hah! We’re so glad you are now a fan of kale chips, Lakshmi! This is the first recipe for kale chips that I’ve come across that has a weight for the kale – thank you! All the others say “1 bunch” or “1/2 bunch”….have you seen bunches at the grocery store? Farmer’s markets? Etc.? They vary in size quite a bit. I’m am weighing my kale and making this recipe immediately. Thanks again! I wanted to take a photo but I ate them all. Great recipe! Hah! We are glad you enjoyed these chips, Kristin! I have three bunches of kale and I just made 1 bunch with this recipe. (I didn’t have sunflower seeds so I went without and then I noticed I ran out of cashews!?!). So I improvised with cashew butter! I checked the label and the only ingredient is cashews and it worked! I made the paste with my hands, mixing the nutritional yeast and butter by hand and added in the garlic powder and salt and pepper! These are the best!! Thank you for this recipe! Great solution! Thanks for sharing, M! Wow, I followed your recipe to a tee, kale chips perfection! I’m so happy! I’m definitely going to try more of your recipes. I like that you talked about why the ingredients are healthy. Just tried with Cavelo Nero which is in season here in the UK. Delish! Easy, delicious, and kid friendly! My son won’t eat a single veggie, but these he enjoyed! Awesome recipe! I haven’t tried this recipe yet, but it will be the next one I try. Dana – I LOVE LOVE LOVE your site!!! You are my guru as I have gone vegan over the past year. One suggestion to add to your arsenal – try an airfryer!! I bought one and it is SO EASY to use! I made perfectly crispy kale chips in it in 5 minutes, not to mention vegan crab cakes, and some other meat items for friends. I would LOVE to see what you do with an airfryer! This turned out amazing! We will be making this again! Very interesting cheese is not listed in the ingredients ingredients! Um, there seems to be a typo in this. When describing nutritional yeast, you said it was a complete protein because it contained all eighteen essential amino acids; there are only nine essential amino acids. Otherwise, great recipe! Wow does not cover my discovery of this. It’s better than all the chips I used to eat. I tend to add a bit more cashews and garlic and it comes out sooooo good. I don’t have sunflower seeds usually on hand. What about substituting those for pumpkin seeds? Do you think that would work? btw, decided to just go for it and it worked great with pumpkin seeds too! Pumpkin seeds or pine nuts will do the trick! It took me two tries to make the kale chips, but batch two was GREAT!!! First batch tasted like dish soap, so I’m thinking it was either me having to hand wash my cookie sheet last minute, or our new stove that I was ignorant to prepping beforehand. I used one bundle of kale with this recipe’s amount of “cheesiness,” and it seemed like I should have used two bunches. But, my cheese turned out pretty thick, like a dry peanut butter. It spread out in an okay way, still thick and chunky in spots, and of course delicious, but I’m noticing your pictures seem dry and flaky like a spice. Any insight to what I am doing differently than you? The only thing I could think of was that I used a hand blender to combine rather than a food processor like you’d mentioned. Thanks! This recipe is amazing. I just finished making it with my teens…we can not stop eating them. So addictive. I think I made a mistake on my second round. Originally I used the regular light green kale bunch from the grocery store. They came out amazing!! Second round I used Trader Joe’s TUSCAN KALE. It tasted more like seaweed. And maybe too much olive oil….as it took longer to cook. Whoops. Ok, my first time making kale chips & I come across your recipe……..where’s the cheese. Never used nutritional yeast. Where do I get it it? hi there, i cant wait to try but i have a bag of cavolo nero kale – can i also use this for the kale chips ? How could i change this time to use a food dehydrator? I dont have great success making them in the oven. Thanks! Hmm, I’m not sure! Never used a dehydrator. Sorry! I’m sorry – but there is something seriously wrong with the bake time on this recipe, and I’m so surprised no one has said anything. Mine were a soggy mess and had to be cooked for something like 10 additional minutes to what it says. 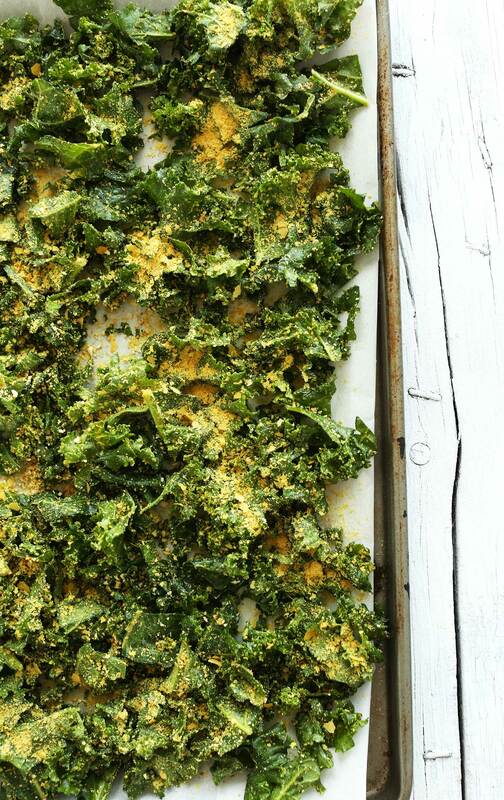 300 is just too low of a temperature to bake these kale “chips” at to get them crispy. The taste is good, so there is that redeeming quality, but like I said, I’m surprised at how wrong the bake time is. Sorry this didn’t work out for you Li! Was your kale thoroughly dried? Or, maybe next time use less oil? I must be missing something. I see sunflower seeds in the ingredients but not in the instructions. ????? Fixed! Sorry for the confusion. The recipe is both easy and it works! I’ve tried other cheesy kale chip recipes and they were a disaster (had to basically wipe each piece of kale with a gooey concoction – a lot of time and they never got crisp). I put the dry ingredients in a jar and make double so I can use it again on another batch (the jar also makes it easy to spread). I have also learned for myself that going smaller – that is making only what I’ll eat that day, is the better choice. I don’t have to do more than one batch in the oven (so I have more energy for other things) and they stay crisper eaten the same day. I have made these 3 times now, and my family loves them! I have used coconut oil twice now, and once with regular oil. I have no idea why, but I love these with coconut oil! Either way they are delicious, easy, and even kale haters don’t seem to mind. Beware to the ones who are overlapping: you will go directly into my mouth before even going in the oven! Loved it! so good! thank you so much! These crisps (I’m a Brit) were absolutely yummy! Loved them and snacked on them for lunch. I used he curly Kale and ended up with the crisps in very small pieces – I used a spoon :). I wonder if Chard will work the same???? Thank you for your lovely recipes, my daughter turned me on to them. My biggest problem was not eating every single one of these tasty morsels as soon as they came out of the oven. I’m not a big fan of kale because I find it just too tough despite all my efforts. After a recent visit to a far distant food co-op, I came home with a bag of very expensive ($5.89) and very small bag of cheezy, spicy kale chips. I thought, gee, if I could make kale taste like this, I’d be happy to eat it every day. And then viola–I found your recipe for kale chips–and the universe became a better place. I had everything on hand–except the sunflower seeds–so I substituted pistachio nuts instead. Thank you for providing a recipe that allows me to actually enjoy this nutrient-filled vegetable. These are ridiculously good and highly addictive!! Made these yesterday and they turned out great! Preparing this recipe marked the first time I was able to successfully make kale chips. I made a double recipe. They are so good, you can’t stop eating ’em! My husband, who is no fan of kale, devoured the remainder in minutes! Whoop! Thanks for sharing, Karen! Five stars is not enough! Yummy! So glad I found minimalist baker. I absolutely love your images, your photography is breathtaking! Looking forward to making many of your recipes :) Thank you! Best kale chips ever! Even my 5 year old likes them! Thanks for a great recipe! I love Kale Chips! This recipe looks delish. Just a quick question. Your method doesn’t mention where I am putting the sunflower seeds. I am sure it is obvious, and I am to place them in the food processor along with the cashews. But I just want to double check! I was just thinking the same thing! Do they go in the food processor mix? Many thanks! I love your recipes so much! I love these kale Chips! They are delicious and easy to make! I am making these! I just bought some nutritional yeast for the first time, even though I’m not vegan… Whoa! I’m putting it on everything! One question, could I sub garlic cloves for the tsp garlic powder? If so, how many? Thanks! Made these last night, super yummy! Very easy to make, and the three year old loved them. Absolutely deeeelish and easy to make. Love these cheesy crunchy chippies. Will totally be remaking these over and over and over as the garden is bursting with kale! Just made these when I got home from work an hour ago and enjoying them now. It’s a little hot in my kitchen (oven use during the summer is brutal) – but it smells divine!! I subbed raw peeled pumpkin seeds for the sunflower seeds, put in sliced garlic cloves because I don’t have garlic powder and I added half a tablespoon of cumin (because I love it). This is a really excellent and easy recipe. Wonderful! Thanks for sharing, Clarisse! I had replaced the cashew cream (could not find any in the house!) with Tahini and it was delicious! I am new to the vegan diet and your recipes has really made it a wonderful transition. My husband and three year old daughter has not had a single complaint! I meant to leave the previous comment for the creamy kale and spinach dip! these area a must make! I’ll admit I don’t love kale but if they are all jazzed up like this then I would prpbably love them! this recipe sounds and looks delicious! I never knew that Kale could be so versatile! Thanks for these amazing ideas. Whoop! Let me know how it goes, Sarah! These look incredible! I am SO in the mood for kale chips…I always tend to make them in the fall/winter, but I think I may give this recipe a try this weekend! Let me know how it goes, Alexa! Oh my god that looks amazing. Kale chips and cheese? Count me in! And 30 mins.. duh, can it get any better? Thanks Kerstin! Hope you give them a try! I think I need to try this recipe. Kale chips are a favourite. These look great! I love your photos. I make kale chips all the time with nutritional yeast, smoked paprika, chili powder… but have not tried with a cashew mixture – I have only purchased them like this. I can’t wait to make them. Thx for the yummy recipe I will be making these soon. Thanks so much! Hope you give them a try! Oh girl, when I first got into making kale chips I made, and devoured, almond butter – maple syrup- cocoa powder – and sea salt covered kale chips. Haha, too weird! When you posted your sorbet recipe, I had posted one just the day or 2 earlier. Then today I posted a kale chips recipe, and I see you’ve done the same. We must be on the same food wave length. Mine are just garlic kale chips though. This recipe looks great! I already love your vegan parmesan cheese which this sort of reminds me of, and I can only imagine this combo being delicious on kale chips. Kale sprinklers! That made me smile. Your experience with discovering kale chips sounds like me when I discovered using dates as a natural sweetener (thanks to you). Whoa-A! I had a constant stream of date paste coming out of my blender. That and cacao powder dust on all of my kitchen surfaces. Dates! Life changing! Just sub more sunflower seeds! YUM! Would taste great with some curry powder too! Ooh, good call! I’ll have to try that next time! Nutritional yeast and kale might be my two favorite ingredients ever. You just can’t go wrong with the combination. As usual your pics are gorgeous. I’m planning on taking your photography school as soon as I can. I have been telling everyone about it – I’m so excited! I need to up my game. Kale is totally my favorite vegetable. I’ve made lots of kale chips, but usually just toss them in oil and salt. This one is definitely going to be my next kale chip adventure! Love kale chips! 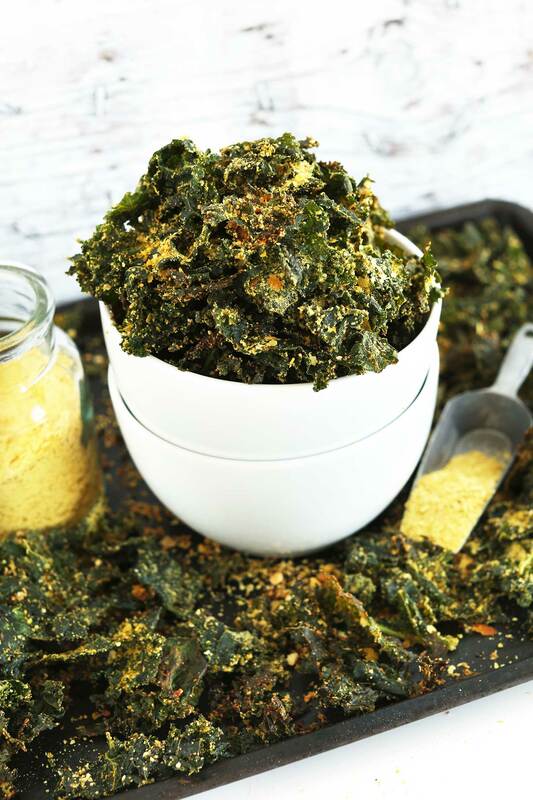 Garlicky kale chips that taste like doritos…? umm YUM! 30 minutes? I’ll take it! SO GOOD! I went a little overboard too with kale chips, but I want to start making them again! I love kale chips! They are so savory and satisfying, thanks for the great recipe! I LOVE kale!!!!! Love it! Love it! Love it! Love it! Love it! This is a whole new way to enjoy! One question, what could I sub for cashews? Love the dairy free ness! I’d suggest just using more sunflower seeds! i used almonds instead of cashews, so delicious! haha, Trader Joe’s is so great! This sounds so delicious- especially on avocado boats. Swoon! Right? Avocados + kale chips = flavor bomb. That nutritional yeast…it’s vegan magic. Beautiful photos, as per usual. Yes yes yes yes! I’ve eaten the TJ’s kind and I love them. Can’t stop. Your version looks nearly identical! Bring on the kale chips! I made salt & vinegar kale chips, but I have not made CHEESY kale chips yet!!! Ooh, you must! I need to try salt + vinegar, too! I looooooove cheesy kale chips and am blown away by this easy-peasy vegan option! Genuis!!!! Nom nom nom one of my favorite snacks! Is it weird how much I love nutritional yeast? LOVE it. Your description of Kale Chips describes how I feel about sweet potato chips, the first time I had them….fireworks went off. It’s like I didn’t even care about Pickleball or playing sports of any kind. And kale is still better for you than a sweet potato (watching my girlie figure here.) Thanks for sharing. These do look easy peasy too, that’s what a guy needs. Haha, not weird! I put it on everything!